Azerbaijani painter Javad Mirjavadov is an unfathomed genius of the 20th century, a non-conformist and a reformer, whose masterpieces have had a tremendous influence on the development of contemporary Azerbaijani art. Mirjavadov`s paintings are presently part of the collections of major art lovers and museums around the world. His works are either unequivocally recognized or rejected, but the further his creative work distances from us in time, the clearer one may comprehend the uniqueness of his grandeur as a classical contemporary painter in Azerbaijan, the merits that Mirjavadov has gained after many years of non-recognition by critics and viewers. The history of the painter`s life is as complicated and captivating as his works. He was the first and the most remarkable figure of the Azerbaijani avant-garde. Though the painter was born to a well-to-do family in Baku in 1923, his ancestors were famed for being ascetics and curers. In a way, Mirjavadov followed in their foot steps, though he cured not human bodies, but human souls by his paintings. A turning point in his creative work came when he was a student and saw a reproduction of Paul Cezanne`s ``Mardi Gras``, experiencing creative regeneration. This passionate, dedicated and fearless man headed to Saint Petersburg to study the works of Cezanne, Van Gogh, Matisse and other outstanding artists of the 20th century. In order to fully grasp the enormous courage of this decision, we must recall that this happened during Stalin`s rule, when taking interest in these painters was considered heterodoxy and even treachery. However, Mirjavadov`s inquisitive mind did not confine itself to exploring art at the Hermitage, and, while in St. Petersburg, he also studied the art of the peoples of Congo, Benin and Ivory Coast at the Museum of the Orient. Further, he sought information about the Turkic nations` traditions of Shamanism. The nature of the Absheron Peninsula was an inspiration for the artist, which enlivened his creative outlook. The artist`s conscience remarkably captured on-rock carvings of primitive human beings, ancient volcanoes and archaic graves. In his paintings, Mirjavadov reflected upon all the layers of world culture -- spanning from Oriental miniatures and antique art to African masks and the heritage of western Europe`s great artists. Mirjavadov`s far-reaching view explores how a man can be wise or silly, loving or lukewarm, noble or faint-hearted. His paintings indicate the versatile colors and mixture of human qualities. There is not a single bit of idealization or lies. Due to his straightforward and independent approach, non-compliant with Soviet ideology, the artist was shunned by the political system and did not live long enough to receive due recognition. 1985 was one of the most challenging years of his life. Persistent financial constraints, health problems and -- the most disappointing of all - non-recognition of his talent, caused the painter to fall into a world of darkness. In one of those days the elderly, ailing and down-hearted artist asked his wife to turn on the TV, and on the screen was the smiling face of writer Chingiz Aytmatov, who just arrived in Baku. Half an hour later Mirjavadov and his spouse were at the guest house, and the artist told the crowd of admirers that he would be the first to meet the renowned writer. A minor squabble ensued, and Aytmatov`s friend, writer Leonid Latynin, came out after hearing the noise…Having looked at the slides of Mirjavadov`s paintings, he unexpectedly asked the Mirjavadovs to come in. Mirjavadov`s first private exhibition took place in 1987 when the artist was 64, and it was the first-ever opportunity to familiarize a wide range of viewers with his works. 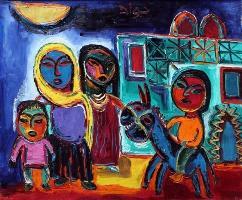 In 1987, when the breeze of freedom swept through the country, the daring painter was unexpectedly elected to the administration of the Union of Artists; the documentary ``This is Javad`` about the artist was shot; and the reproductions of his paintings were published in the Gobustan magazine. A year later, Mirjavadov was named a renowned art figure of the republic. In 1988 Mirjavadov`s drawings were included in an exhibition held in Japan. Mirjavadov got his first opportunity to travel abroad -- to faraway Denmark -- in 1989. But as early as in 1988 Mirjavadov was diagnosed with the ruthless ``atrophy of the brain``. The painter battled the illness for four years before he died. He passed away on a train. Suffering from severe illness and still unrecognized, he has proven with his whole life that he was a real painter. Javad left this world with his eyes wide open. Author, arts critic Nargiz Hajiyeva extends her gratitude for the material provided by Lyubov Mirjavadova.